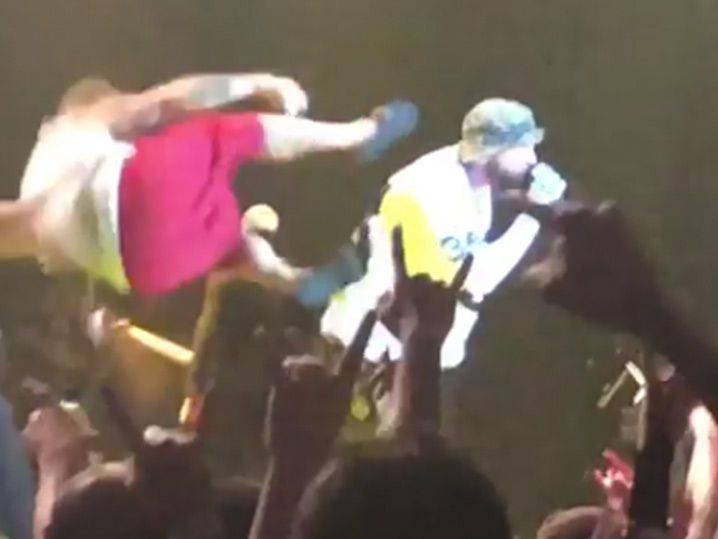 Insane Clown Posse‘s Shaggy 2 Dope attempted to do something truly crazy this weekend to fellow rocker Fred Durst … a running dropkick — which totally crashed and burned. Fred was performing with his own band, Limp Bizkit, Saturday night at the 2018 Rock Allegiance Festival in Camden, New Jersey when Shaggy tried rushing him on stage with a WWE wrestling move that completely backfired. The dropkick ended up dropping Shaggy more effectively than it did Fred … and security quickly dragged him away to the side stage. Fred was hardly rocked by the kick, which came up just a bit short, and he calmly announced to the audience … “What a p***y. Couldn’t even pull it off.” As the stage handlers attempted to contain Shaggy, it appears another person in ICP’s camp got into it as well. No word on what Shaggy’s beef might’ve been with Fred — the two have collaborated in the past, but it’s anyone’s guess what triggered this. We’ll leave it to the Juggalos to decide.